The state-of-the art Convention Centre-New Delhi City Centre, located opposite Jantar Mantar, Parliament Street, New Delhi, India. This convention centre was inaugurated by the Home Minister, P Chidambaram, in December last year. 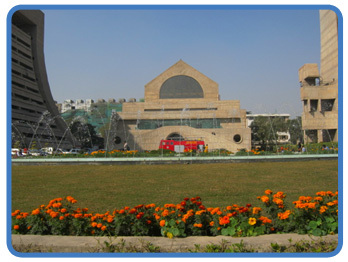 It was constructed by NDMC on the lines of Vigyan Bhawan, New Delhi, India. The convention centre has two auditoriums, six conference halls and facilities like videoconferencing and central air-conditioning. It has digitally controlled speakers and projection facilities. The first floor has reportedly six conference rooms and the building has an automated underground parking lot for about 900 cars.